Home » Our Stories » We Won! Thank you, Ithaca! 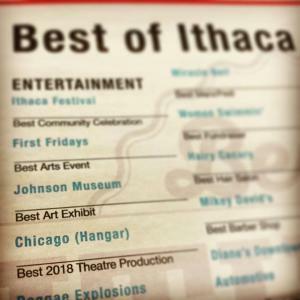 Chicago at the Hangar won Best 2018 Theatre Production. See us featured in this week’s Ithaca Times. Thank you to our community for your votes and support! To see the full “Best Of” list, click HERE. Congratulations to Michael Barakiva (our Artistic Director and the Director of Chicago) and our cast and crew!